Above: unconfirmed render of the Galaxy S10 and S10 Lite. 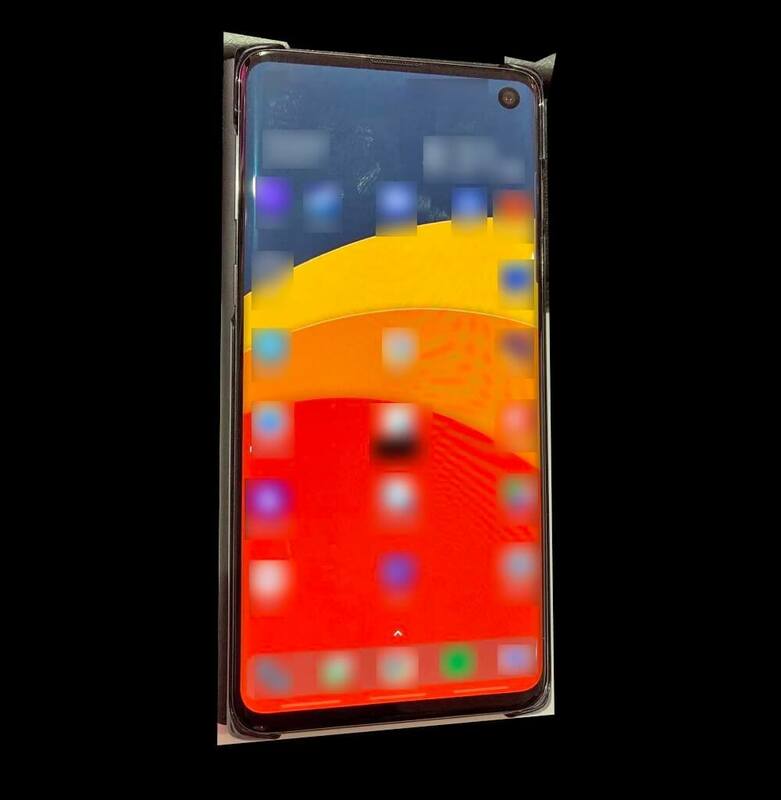 Below: Evan Blass' latest leak which is almost certain to be what the real-life Galaxy S10 will look like when finally launched come February. The hole punch goes on the upper right corner. For the unaware, Blass leaks the next Galaxy S phone shortly before its launch at Mobile World Congress in February. He’s been dead right for the last few years, making this leak about the most reliable you can get. That being said, there are some interesting things going on in the picture below. For one, there are no virtual buttons at the bottom of the phone, just three straight lines. This is something we’ve seen before from other manufacturers and third party apps where each line corresponds with a button, but most people have criticized that kind of interface for being clunky. It would be surprising to see the new Android 9 Pie button configuration not enabled by default. 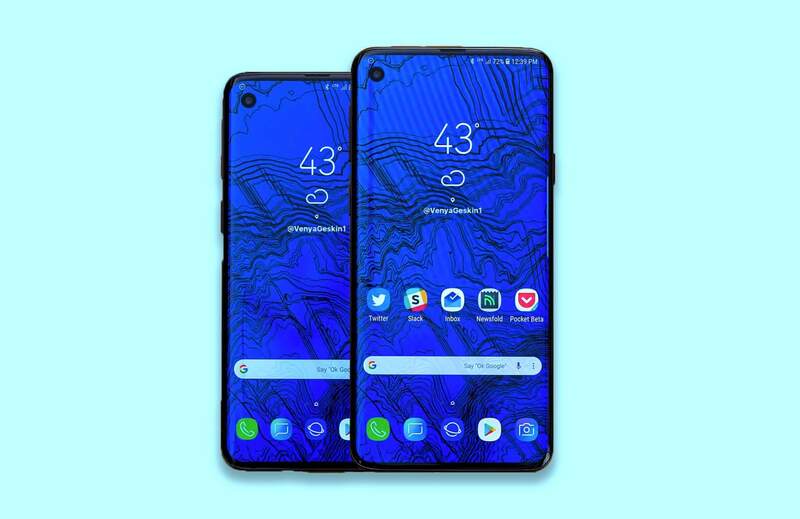 However, the phone has been substantially changed from any default settings: the background is not something Samsung would launch with, the app icons are arranged in what looks like a 5x7 grid, and the phone looking icon in the bottom left corner is different from Samsung’s One UI design. In One UI and Samsung’s recent icon releases, the phone logo has always been within a block shape. Once the phone's tilt is corrected for, the aspect ratio of the phone seems to be about in-between the 18.5:9 the S9 had and the 19:9 the S10 is rumored to have, so it’s hard to draw a conclusion there. Intriguingly the case the phone seems to be in has gaps along the whole width of the bottom and the top – could it be the first phone with top and bottom-mounted stereo speakers? That’d be pretty awesome. Looks nice, but I think I am not the only one who thought that the previous gen line was already beyond reasonable price and decided to buy something else. p51d007 and Dustyn like this. Smartphone designers run out of ideas. Notches, holes, 6 cameras. I got an idea for them: a phone with flat screen that doesn't stick out and brake at first drop, bigger baterry, a phone might be slightly fatter, actually You hold it with more confidence and it doesn't bend in Your pocket, screen 5 inch maximum, preferably with a battery replaceable on the fly and whole phone assembled with screws instead of glue. US$400 max. Will be a hit, I promise. paytonpenn, Hexic and psycros like this. It's looking almost as repulsive as a full blown notch. If they mess up new Note 10 this way, the phone can be best out there, but I am not buying a phone that is almost all screen with compromised, damaged screen. psycros and noel24 like this. Worse and worse every year. In my view, Galaxy S7 was the sweetspot as format goes. Not too big of a screen, not too wide, not too tall. The edge is thicker so you can grab it with more confidence and the sides are slightly rounded. They should just make it with an unbreakable display/back, graphene battery (say 6000mah), move Exynos 8890 (which has plenty of power for everything) to 7nm to make it more efficient and double sensor size while keeping resolution the same. Current gen phones are too tall in my view. The upper part of the phone is simply useless cause you can't reach it. Also, when in landscape, you get black bars on each side. Stupid. Those holes in the screen look absolutely ridiculous. Right now there's no way to engineer out the camera under the display. Those motorized pop-up cameras are terrible on the Oppo Find X and all that other junk. I honesly don't have a problem with the notch on XS Max. When you watch Videos, the video takes up the display below the notch and it's still bigger than my iPhone Plus model's viewable display. But I won't be buying it until they release the latest version where I can fold it into origami. I like the idea, but I definitely have my doubts abou the success such a phone would have. "Those holes in the screen look absolutely ridiculous. I honestly don't have a problem with the notch on XS Max." It's all in the hands of marketing departement, baby. If they can sell $1200, disposable, biodegradable phones with holes in the screen and spider eyes at the back, why couldn't they sell a durable phone for "overworked businessmen"? GIANT dead pixel right on your screen, HOW ABOUT NO. Who's this Evan Blass...and how is he able to "leak" so much classified information? Companies' pursuit of relentless bezel-free design has obliterated the face of the company. Soon there will faceless phones which all will look similar with just screens tacked on top. Copying of the infamous notch was the most ridiculous move almost every company made. Absolutely, uninspiring. Whatever happened to the tech world. Just another PoS not worth close to a grand or whatever stupid price they will ask. Even Crapple in their infinite greed has recently started to admit that they are going too far on what they are charging for phones. It DOESN'T matter how powerful a mobile phone is as in the end these companies like Crapple and Bloatsung are making $$$ hand over fist with all of the sheeple out there. When in bulk the components and assembly time for a device only costs the manufacturer $200 and then yet charges over $800 at the register that is price gouging and all of the *****s out there that keep buying them just continue to roll the status quo. Just more reason to show that the human race is too stupid to be the predominant life form on this ball in space and we DO NOT deserve to populate any other planets. As good as a big mole on the tip of your nose. Just as irritating to look at.